Isotretinoin (aka Accutane/ Acnotin/ Roaccutane/ Nimegen/ Oratane) is “The Nuclear Option” for treatment of Severe Acne. This is the medicine that I prescribe when literally nothing else works for severe cystic acne in hot, sunny, humid Singapore. Why is Isotretinoin or Roaccutane so effective? Because it is the only treatment that targets ALL 4 causes of acne. The 4 causes of acne are: excess oil production, clogged pores, excessive bacteria P. acnes and inflammation. However, you will need to take Isotretinoin treatments for months and even up to 1 year. Hence, you should know EVERYTHING about Isotretinoin/ Accutane before starting treatment. 1 What is Isotretinoin/ Accutane Acne Treatment? 2 How does Isotretinoin/ Accutane Work? 3 Does Accutane affect hormones? 4 What are the side-effects of Accutane (Isotretinoin)? 5 Does Accutane/ Isotretinoin affect future pregnancy? 6 How long does Accutane/ Isotretinoin stay in your body system after stopping it? 7 What does Accutane do to your face? 8 What’s the recommended dosage of isotretinoin/ accutane? 9 What is the conventional dosage of isotretinoin/roaccutane? 10 Should I take isotretinoin before or after food? 11 Will isotretinoin cure my acne forever permanently? 12 How long do I have to take isotretinoin for? 13 How does isotretinoin affect pregnancy? 14 Does isotretinoin increase risk of sunburn? 15 What worsens my Acne? 16 Is my Acne serious enough to require Isotretinoin? 18 What to Expect When You are on Isotretinoin/ Accutane Acne Treatment? 19 Does Accutane cause depression? 20 When Can I Stop Accutane? 21 What is the cost/ price of isotretinoin (Accutane/ Acnotin/ Roaccutane/ Nimegen/ Oratane) acne treatment in Singapore? 22 Can I undergo lasers or chemical peels when I am on Accutane/ Isotretinoin? What is Isotretinoin/ Accutane Acne Treatment? Isotretinoin (Accutane/ Roaccutane/ Oratana/ Acnotin/ Nimegen) is a synthetic derivative of vitamin A. It is primarily used to treat severe cases of acne which don’t respond to anything else. In Singapore, it’s a prescription-only drug that is taken orally. Isotretinoin pills can only be prescribed by doctors. It has been used by dermatologists and skin specialists since its US FDA approval in 1982. Your dosage highly depends on the severity of acne, but ranges from 0.5 mg to 2 mg daily, with low-dose recommendations becoming the new standard of care. Despite Accutane having a very high success rate of acne removal (about 90%), a course of Accutane can last anywhere from 3 to 10 months! How does Isotretinoin/ Accutane Work? Isotretinoin works by limiting the amount of oil your body produces. Even up to an 80% reduction in oil/ sebum production. Because acne in the most basic sense is simply an overgrowth of bacteria in a clogged pore, you can imagine why this is so effective — less oil means less room for bacteria to thrive. It also significantly reduces oil gland size, regulates cell-turnover rate, and has anti-inflammatory properties. This is especially important in Singapore because hot and humid weather promotes oil production and clogged pores – resulting in bad acne. In fact, if you understand how isotretinoin works, you might see why it can have certain related side-effects like dryness of lips. Isotretinoin influences pituitary hormone levels in acne patients. Studies have shown that isotretinoin causes mild suppression of pituitary hormone levels, which may be beneficial for tackling the pathogenesis/ causes of acne. Isotretinoin is a “category X” drug. This means that it can cause birth defects if taken during pregnancy. This safety concern has made it mandatory for females to take birth control while on Accutane to minimize the chances of unwanted pregnancy. This is why isotretinoin acne therapy should only be taken under supervision by an expert skin doctor and should not be taken lightly. Essentially, Isotretinoin reduces oil and sebum production – everywhere. Does Accutane/ Isotretinoin affect future pregnancy? Isotretinoin does not affect fertility. One month after finishing a course of isotretinoin, you may get pregnant with no additional risk to your unborn baby. How long does Accutane/ Isotretinoin stay in your body system after stopping it? It is recommended that a woman wait one month after stopping isotretinoin before trying to become pregnant. Usually, isotretinoin is no longer found in a woman’s blood 4-5 days after the last dose and most of its by-products should be gone within 10 days after the last dose. What does Accutane do to your face? Isotretinoin is designed to treat severe acne, it has a visible effect on the skin. You will see a visible improvement in all forms of acne – from the most severe cystic acne to reduction in whiteheads and pore size. What’s the recommended dosage of isotretinoin/ accutane? The recommended dosage is customised according to your skin condition and severity of your acne. Accutane dosage can range from ultra-low dose of 10mg every 2 weeks to 30-40mg daily. This all depends on the severity of your acne and whether you have any side-effects. What is the conventional dosage of isotretinoin/roaccutane? When used for severe acne vulgaris, isotretinoin is commonly initiated at a starting dose 0.5 mg/kg/day for the first month, then increased to 1.0 mg/kg/day thereafter as tolerated by the patient. In extremely severe cases, even lower starting doses, with or without the concomitant use of oral steroids, may be needed. In earlier studies of optimal dosing of isotretinoin in patients with severe pimples, doses ranging from 0.1 mg/kg/day to 1.0 mg/kg/day were most commonly used. Should I take isotretinoin before or after food? Isotretinoin is highly lipophilic and is best absorbed when taken WITH food. Patients should be instructed to take isotretinoin with meals. One formulation, isotretinoin with lidose, uses lipid agents to encase the medication, bypassing the need for food, and can be taken on an empty stomach. Will isotretinoin cure my acne forever permanently? Yes, potentially. Most acne treatments, however, have little effect on severe acne. Isotretinoin can clear severe acne when other treatments fail. With just one treatment, isotretinoin can permanently clear the skin. One treatment typically lasts 4 to 5 months. However, 5-10% of patients might have a possible relapse. How long do I have to take isotretinoin for? A course of treatment generally lasts about 4 to 5 months. It can run shorter or longer. Some patients even have to take up till 1 year of isotretinoin medications. Some patients do not clear after one course of treatment, and a second course of treatment may be an option. Studies show this helps some patients see clear skin. How does isotretinoin affect pregnancy? ◦Do not start taking isotretinoin while pregnant. ◦Do not become pregnant while taking isotretinoin. If you plan to spend time outdoors, it is important to know that isotretinoin can make your skin more sensitive to the sun. You can sunburn unexpectedly and quickly. ◦Avoid the sun as much as possible when outdoors. ◦Wear a shirt, wide-brimmed hat, and pants. ◦Apply sunscreen to all skin that will be exposed. The type of sunscreen you use is important. ◦Broad-spectrum protection (bottle may say “UVA/UVB protection”). ◦An SPF of 30 or greater. Because isotretinoin can make your skin more sensitive, it is especially important that you DO NOT tan. This includes not using indoor tanning (sunlamps and tanning beds) while taking isotretinoin. Endocrine factors: Are menstrual periods regular? Is there hirsutism? Polycystic ovary syndrome, Cushing’s syndrome, 21-hydroxylase deficiency and other endocrinopathies are frequently accompanied by acne. Is my Acne serious enough to require Isotretinoin? We use the official grading scale to classify Acne. Moderate or severe acne will require isotretinoin. Localized acneform eruption with history of preceding friction or occlusion. More common in athletes. History of drug use and abrupt onset within days of exposure. Widespread involvement, atypical location, atypical age of patient and improvement with drug cessation are further clues. Comedones, pustules and cysts are commonly found behind the ears, axilla and groin. Occurs in patients treated with long term antibiotics. Can also occur after hot tub immersion. What to Expect When You are on Isotretinoin/ Accutane Acne Treatment? If this happens to you don’t be discouraged, it simply means the medication is working. These side effects will subside soon enough and your acne and pimples will improve. In other words, someone who takes Accutane is 2.68 times more likely to develop depression than someone who doesn’t. 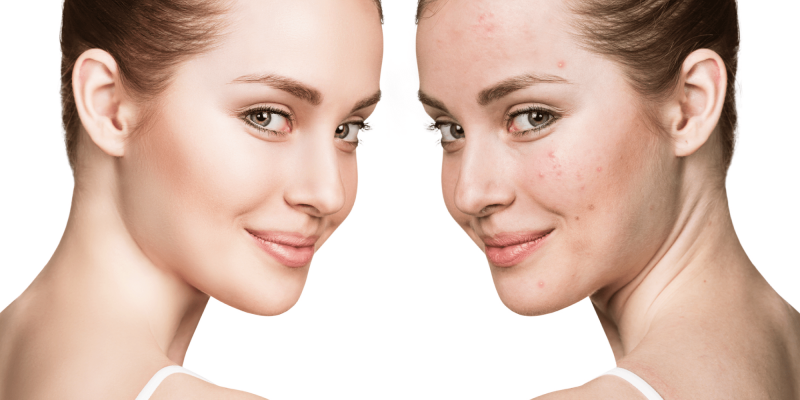 Finally clearing your acne has a huge and lovely impact on your confidence and wellbeing. The link between isotretinoin and depression is still controversial. It is unclear whether patients with pre-treatment history of depression are more at risk with isotretinoin. There have been reports implicating isotretinoin with mood change, but no definitive studies have been published to date. When Can I Stop Accutane? Maintenance therapy when pimple free. An expert skin doctor will be able to guide you through this journey safely with minimal side-effects and complications. What is the cost/ price of isotretinoin (Accutane/ Acnotin/ Roaccutane/ Nimegen/ Oratane) acne treatment in Singapore? Isotretinoin (Roaccutane/ Accutane/ Acnotin) costs from $150 to $250 for 1 box (30 tablets). The total cost of treatment is dependent on your daily dosage of isotretinoin and the duration of your acne treatment. Can I undergo lasers or chemical peels when I am on Accutane/ Isotretinoin? Yes. It is generally safe. The latest studies show that there is no increased risks of complication or poor wound healing when you do ablative or non-ablative laser treatments even while on Accutane. In fact, severe cystic acne often requires more than just isotretinoin oral acne therapy. Speak to us for a customised and flexible acne treatment plan. We use chemical peels, lasers and anti-acne steroid injections in addition to isotretinoin to help you to get rid of acne fast.